Israel will look into the shooting of a Canadian-Palestinian doctor along the Gaza border, Prime Minister Benjamin Netanyahu said Thursday, while rebuffing calls from his Canadian counterpart for an international probe of why Israeli forces used live ammunition on a crowd of thousands. Mr. Netanyahu spoke on the phone Thursday with Justin Trudeau, who had earlier denounced Israel's "excessive force" at the Gaza border, where Israeli soldiers killed nearly 60 people on Monday. The killings took place while the United States was opening its new embassy in Jerusalem, which it now recognizes as the capital of Israel. The hundreds of people wounded Monday included Tarek Loubani, an emergency doctor from London, Ont., who was shot in the legs. One of his paramedics was also killed. “I remember looking at my shoes and I remember thinking, ‘My god, how did so much blood get there so fast,'" Dr. Loubani told The Globe and Mail in an interview. The protests dropped off dramatically after Tuesday, which Palestinians observe as Nakba Day, the anniversary of the conflict that led to Israel's creation and drove hundreds of thousands from the region. Israel's treatment of Palestinians came under renewed criticism on Friday from the UN's human-righs chief, Zeid Ra’ad al-Hussein, who said 1.9 million people in Gaza are “caged in a toxic slum from birth to death." This Tuesday was Nakba Day, a day of mourning for Palestinians on the 70th anniversary of the “nakba,” or catastrophe, which is what Palestinians call the uprooting of hundreds of thousands who fled or were expelled during the 1948 war that led to Israel’s creation. In addition to the planned ceremonies of mourning, Palestinians spent Tuesday burying their dead and launching new demonstrations in the West Bank. Thousands of mourners attended funeral rallies, many waving Palestinian flags and some calling for revenge. May 15, 2018: A Palestinian demonstrator holds a sling during a protest marking the 70th anniversary of Nakba, near the Jewish settlement of Beit El, near Ramallah, in the occupied West Bank. On Monday, the U.S. opened a new embassy in Jerusalem, officially recognizing it as the capital of Israel. The relocation of the embassy, which U.S. President Donald Trump first announced in December, was a controversial move that breaks with decades of official U.S. policy. The American delegation was led by Deputy Secretary of State John Sullivan and included Treasury Secretary Steven Mnuchin, four Republican senators, Jared Kushner and Mr. Trump’s daughter and senior adviser, Ivanka Trump. 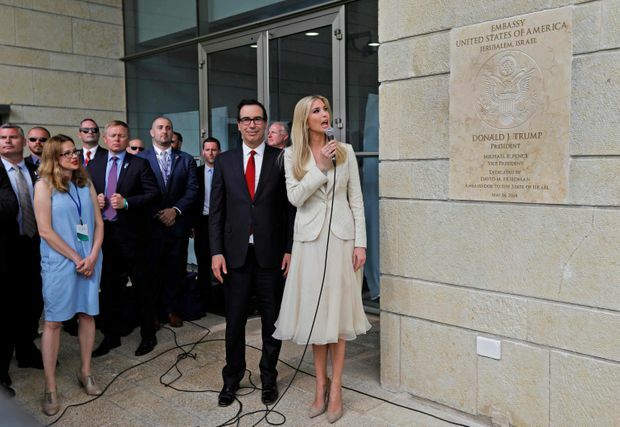 US Treasury Secretary Steve Mnuchin (L) and US President's daughter Ivanka Trump unveil an inauguration plaque during the opening of the US embassy in Jerusalem on May 14, 2018. In a speech at the ceremony, Jared Kushner, Trump’s son-in-law and Mideast adviser, also spoke of a resolution to generations of conflict. “When there is peace in this region, we will look back upon this day and will remember that the journey to peace started with a strong America recognizing the truth,” he said. The opening was overshadowed by violence along the Gaza border, where Israeli soldiers shot and killed dozens of Palestinians during mass protests. It was the deadliest day there since a devastating 2014 cross-border war. 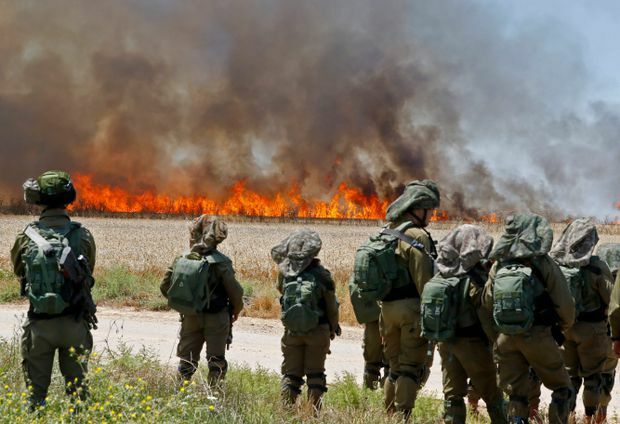 Israeli soldiers walk amidst smoke from a fire in a wheat field near the Kibbutz of Nahal Oz, along the border with the Gaza Strip, on May 14, 2018 which was caused by incendiaries tied to kites flown by Palestinian protesters from across the border. In all, 2,771 people were wounded in Monday’s unrest, World Health Organization official Mahmoud Daher told The Associated Press Tuesday, citing figures from the Health Ministry and a group of aid agencies. Of those, 1,360 were wounded by live fire, 400 from shrapnel and 980 from gas inhalation, he said. France: French President Emmanuel Macron condemned the violence against Palestinian demonstrators in Gaza in a statement released late on Monday and reiterated his opposition to the move of the U.S. embassy to Jerusalem. Mr. Macron talked with Jordan’s King Abdullah and Palestinian President Mahmoud Abbas on Monday and is planning to talk with Israeli Prime Minister Benjamin Netanyahu on Tuesday, the presidency said. Turkey: One of the most vocal critics of the U.S. move and the violence in Gaza, Turkey’s government declared three days of mourning for those killed. President Recep Tayyip Erdogan described the actions of the Israeli forces as a “genocide” and Israel as a “terrorist state.” Turkey also said it was recalling its ambassador to the United States over the U.S. embassy move, saying it “disregarded the legitimate rights of the Palestinian people” and would “not serve peace, security and stability in the region.” It also recalled its ambassador to Israel. Iran: “We will always stand against aggressors and oppressors and believe that the ultimate victory belongs to the oppressed and Palestinians,” President Hassan Rouhani was quoted as saying Wednesday by state media.